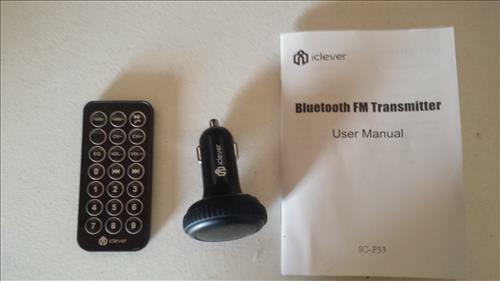 The iClever IC-F53 is a Bluetooth FM transmitter that can wirelessly transmit music or calls to your cars speakers via the radio. It does this by wireless pairing to a smartphone or other Bluetooth device. 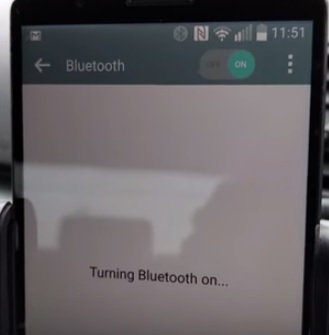 After a Bluetooth device is paired the car stereo is set to empty spot on a FM radio. 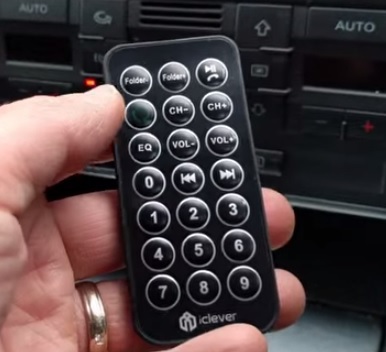 The iClever is also set to the same FM empty spot and will play music and calls over the cars speakers. 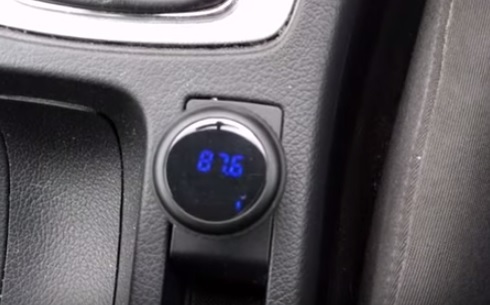 This is good easy fix for cars that don’t have Bluetooth built in. The unit is powered by a vehicles cigarette lighter. It comes with the iClever unit, instructions, and a remote control. The unit itself has controls on it but the remote comes in handy. Pairing is easy enough by going into your phones settings and scanning for Bluetooth devices. After your phone is paired find a FM channel on the radio that is static and not used. 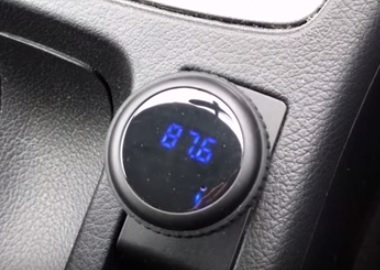 The unit itself has a dial that can be set to the same FM radio frequency. The remote control can also be used and was easier to use at least for me. The controls on the unit are done by pressing the device for 2-3 seconds until it starts blinking. The outer dial can than be turned to the radio frequency. The remote control was easier for me to use than the controls on the unit. Mainly since the location of the cigarette lighter in my car. The remote can fully control the device such as tuning to a FM station or answering a call. This would also be handy in a RV type setup. The sound the music makes will depend on your cars stereo how well it plays. While audiophiles may find something wrong with it everything played as if I was tuned to a FM station and was playing music. I used a Android phone for testing along with different media to play from YouTube to Pandora. All played well and streamed to the speakers. The hands free calling worked OK but could be better. 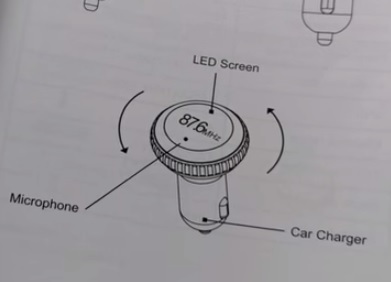 The unit has a built-in microphone for talking. Sometimes the microphone doesn’t hear as well as it should. Once you get used to it and talk toward the units mic it is bearable but some callers will have trouble hearing you at times. If you need the unit only for hands free calling than there are better units available. Playing music over the cars stereo is the main function and what it does well. The microphone is small and barley visible on the unit itself but is located on the top. It has a Micro SD slot that can use up-to 32GB card. If you dont want to stream from your phone or other Bluetooth device music can be copied to a SD card and inserted into the iClever. The Bluetooth is 4.0 and backward compatible with 3.0. The iClever IC-F53 is a good FM transmitter for your Bluetooth phone or other devices such as a iPod. It does what it is supposed to do which is play music over the cars stereo when there is no built-in Bluetooth available. Playing music works great and I haven’t had any issues. The hands free calling doesn’t work as well and can use a better microphone. If you travel to other cites you may run into interference on the FM station and have to pick another unused FM spot. Changing to a new unused station is quick and easy especially with the remote. I did have the idea that in heavily populated areas removing the cars antenna since there may be more FM stations transmitting making it harder to find a open spot. So far I have been able to quickly find a open spot at new locations when traveling. The iClever IC-F53 is working great for me so far. I will update if there are any changes.